Well, this is a new one, even for me [heh]. The Scones! Very interesting is the fact that scones are actually of Scottish origin, which I found totally by luck. However, they are usually made of wheat, barley or oatmeal and represents a basic component of cream tea or Devonshire tea [thank you, Wikipedia heh]. They usually come with raisins, currants, cheese or dates inside of them, but I decided to make them a bit more fun, with strawberries and chocolate. Beat that! In a large bowl start mixing, the flour, baking soda, baking powder, sugar and salt together. You will also need half a cup of cold butter for this, cut it into small pieces and add it to the flour mixture. Next, using a pastry blender or two knives, cut in the butter into the flour, until it resembles peas. I actually end up using my fingers but… whatever works I guess [heh]. Now go back to the strawberry bow and add the chocolate chips. Don’t eat them though! In another small bowl mix the buttermilk and the egg together. Add the buttermilk mixture to the flour mixture and using a fork or wooden spoon mix everything together. Mix the chocolate and strawberries together and add them to the dough. Confusing? Just mix everything together [heh]. 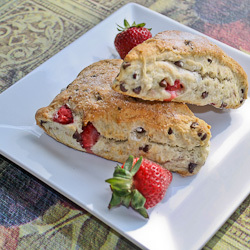 Place the scones on a cookie sheet that’s lined with parchment paper, or a silpat and you can also sprinkle some sugar on them. Bake them for about 20 minutes or until golden. Now check this out! Preheat your oven to 400° F / 204° C.
Wash your strawberries and cut them in quarters. In a large bowl, mix together the flour, sugar, baking soda, baking powder and salt. In another small bowl, mix the buttermilk and egg together. To the flour mixture add the cubed butter and using two knives or a pastry blender, cut in the butter until the dough is crumbly. Add the buttermilk mixture to the flour mixture and mix well using a fork or wooden spoon. Add the strawberries and chocolate chips to the dough and roughly mix everything together so that it’s nicely incorporated. Turn the dough over onto a floured surface, and form the dough into a round disk. Cut the dough into 8 triangles. Place the scones onto a baking sheet lined with parchment paper or a silpat and bake for about 20 minutes or until golden.